Simrad Screen Shot of Stripers [arches] beneath balls of bait. I was using chirp at the time of this pic and notice the individual pieces of bait within the bait balls. Chirp is also clearly identifying each Striper very clearly. Stripers were not feeding here as is evident of the lack of streaking arches. Another Simrad shot of a couple of Stripers [arches] on the left side of a couple balls of Herring. 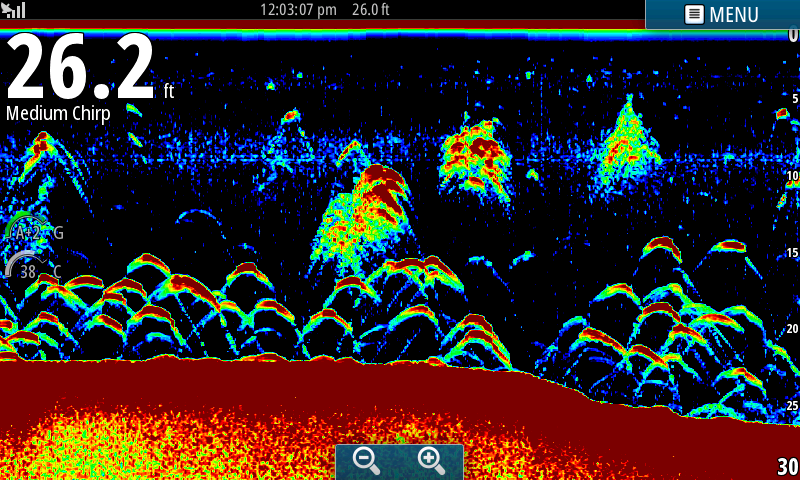 This is a Lowrance shot with a very busy screen. Notice in the history bar that I had been over this for some time. 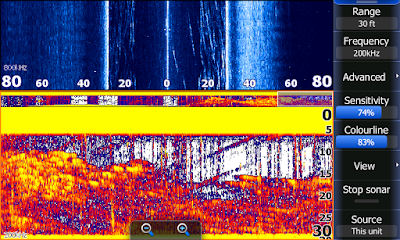 The sonar screen on the bottom shows a whole lot of bait [mainly on the left] but if you look closely the right side of the screen is drawing arches. 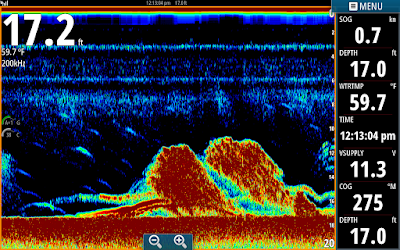 The Side scan confirms with the white vertical dashes that in fact there are some fish next to the bait. This is a broadband shot but if I would have had chirp enabled it would have distinguished the bait vrs the fish better. I took this shot off of my bow mounted Lowrance. 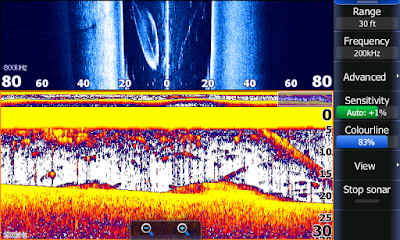 I am using sonar and Side Scan to locate and catch bait. I had seen bait hugging the bottom and threw the net [in the water column just to the left of the boat between 0 and 20 feet] a little late and missed my target. 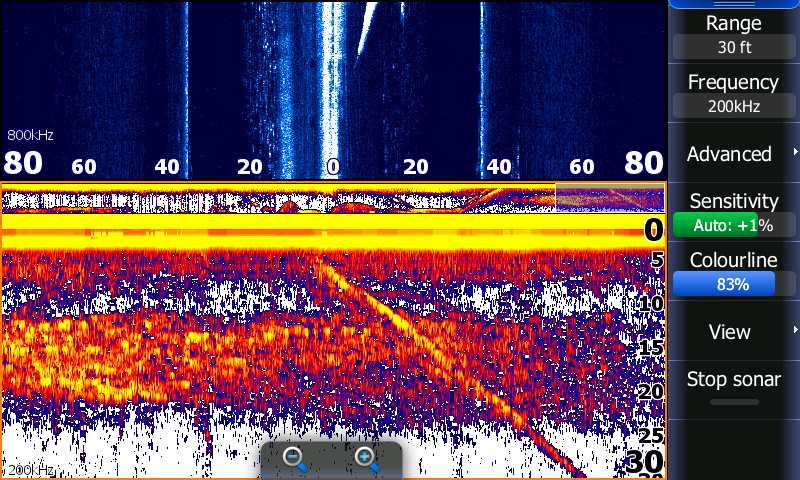 On the right side of the sonar screen you can see the net falling to the bottom. You can actually see the individual 1 inch round sinkers on the bottom of the net in the side scan view. The net opened perfectly and is sinking to the bottom [at the 20 foot mark]. 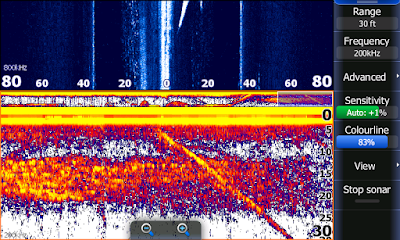 It appears on the screen that the right side is sinking faster than the left but remember...this is side scan...the transducer is looking out to the side of the boat therefore the 0 line is the surface and 20 is the bottom...the sinkers nearer the bottom and the center horn is closer to the surface. If you were underwater looking at the net fall it would look exactly like this. In this Lowrance bow mounted pic I threw the net off of the front of the boat. 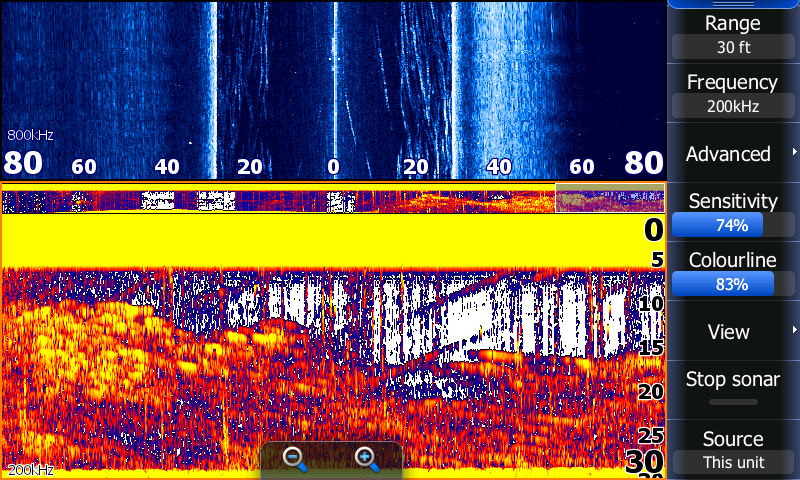 You can see in the sonar the net falling threw a major school of bait but since I threw it forward of the transducer it did not show up out to the side in side scan. I have a LSS2 mounted on the bottom of my trolling motor and simply turn the motor with my remote to locate the bait then in this case I threw on them in front of the boat before the boat got over them and spooked them. If you are not seeing pics like these on your depth finders check out my setting to see if you are set up right. If you are ready to upgrade, stop by Greentop and talk to the Pros there. They have more knowledge of the products they sell than anywhere else I know. When you buy from them they will go over the unit completely, pull the one out of a box when you purchase it and check for updates and update them, set up the unit for the body of water you fish but most importantly will accept any of your calls while you are on the water to help you get the most from your depth finder. There knowledge of Navico products is comparable to the owners manual, but it is easier to speak with someone rather than fumbling through a complicated manual. Even I check with them on occasion when I can't figure it out. The Guru's at Greentop are Steve Lane and Thomas Harris. If you are looking for a Lowrance that has GPS, Sonar, Side Scan and Down Scan including a total scan transducer in a 7 inch format check out the Elite 7 TI for around $800. That will be the next unit I put on my bow. Go see them, you will be glad you did!